I’ve owned my Alessi 9090 Stainless Steel Stovetop Espresso Maker for over 7 years and I still love it to this day! Ever feel like having an espresso drink but didn’t want to go out to a cafe and stand in line to get one? Or maybe like me, tired of paying high prices for a quick pick-me-up drink that doesn’t exactly help the budget? In this review, I share with you how you can enjoy all your favorite espresso drinks right from your own home by using what I consider the best stove top espresso maker on the market… and why. Do I Own an Alessi 9090? Yes, I have owned my Alessi 9090 for over 7 years and still love it to this day. It was not a gift, I paid for it with my own hard earned money and I have never ever looked back. I use to make everything from rich mochas to frothy cappuccinos to Americanos to straight shots of organic smooth espresso. You can check out my video links at the end as total proof! Think about it, at just $4 for a mocha grande at two times a week is $416 per year. Okay, let be more realistic. $4.15 (for a mocha no thrills) four times a week on the way to work comes to $863.20 per year. That’s not counting weekends and evening cravings on the way home. You will easily… sooo easily recoup your money and then some! With the Alessi (or other makers) you have 100% control over the quality of the ingredients (like using organic milk and organic espresso) that go into making the perfect hot (or iced) espresso drink. That’s one of my favorite facts about owning my Alessi. I use organic grass-fed whole milk and organic ground espresso I order online. I even use organic chocolate syrup or cacao powder. I don’t think you’ll find that kind of quality anywhere but in your own home. You can place the maker in a plastic bag and then wrap securely with a soft towel, and pack it in the suitcase! Yes, I even travel with my espresso maker when visiting family to make sure I can still enjoy my morning and afternoon shots. If you do travel with it, make sure to bring enough espresso for everyone because trust me, you won’t be making it just for yourself! If you do travel with it, make sure to bring (or purchase at a grocery store) enough espresso for everyone because trust me, you won’t be making it just for yourself! These small econo-sized espresso makers are extremely popular all over Europe and have been gaining popularity here in the U.S. There are actually two Alessi named stores, one in NY and one in San Francisco. You can purchase them online through sites such as Amazon which carries all the various sizes. The Alessi 9090 is convenient, sturdy, long-lasting, and ranks as one of the most beautiful and brilliantly designed models with an authentic art deco look and feel. While the espresso maker isn’t the cheapest on the market, it is in my opinion the sturdiest, the most long lasting and well built one I’ve ever seen. The cost upfront more than paid for itself. Is This Espresso Maker Made in Italy? Yes! 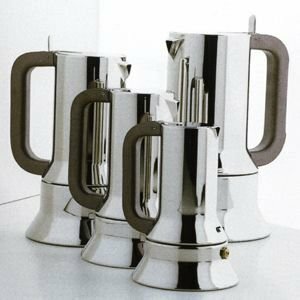 The Alessi 9090s are made in Crusinallo, Italy by an Italian company named Alessi which has been around since the 1920’s. 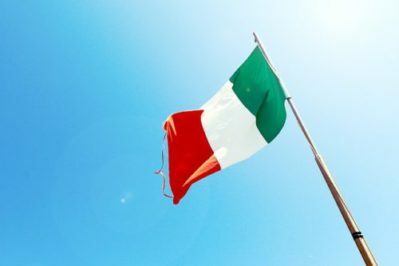 For those familiar with Italian designs – you probably have heard of them. Their focus is to design high-quality products which can be used decoratively in the kitchen. The Alessi 9090 is a perfect example. Made with 100% mirror polished stainless steel from top to bottom, with elegant contours – it is absolutely stunning. Alessi is considered one of the most important “Factories of Italian Design”. Their reputation goes beyond espresso makers and reaches into other products giving themselves a reputation for high quality and sophisticated kitchenware items. I was impressed to learn they employ over 500 workers, and use top designers from around the world to craft quality products which are trendy, aesthetically pleasing and completely functional at the same time. This is their trademark. The Alessi is made of pure stainless steel, both inside and out. This means it will last! I’ve had mine for over 7 years now and it is as sturdy as the first day I bought it. Aluminum is very commonly used for cheaper and less sturdy espresso makers and I do not recommend using those. I’ve used aluminum ones before and I can’t tell you how many I have had to toss out due to pitting and breaking down. The 9090 is elegant in design and style. That’s because it was literally designed during the art-deco era in the 1930’s by designer Richard Sapper. Similar to a tea pot, they are meant to be attractive for serving as well as for decorative purposes. The 9090 has even earned its inclusion in the Permanent Design Collection display at the MOMA (Museum of Modern Art) in New York City, as well as winning the Compasso d’Oro Award in 1979. In regards to functionality, the 9090 uses a brilliant locking mechanism to attach and seal the top chamber to the bottom. 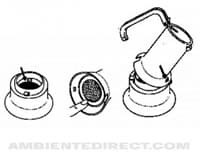 Typically stovetop espresso makers are designed so that the top and bottom chambers screw together, which I’ve found leads to leaking over time. By using the locking mechanism the 9090 is simply a much more sturdy and reliable design. I illustrate what I mean in one of my videos shown in my post “How to Use the Alessi 9090“. By using the locking mechanism the 9090 is simply a much more sturdy and reliable design. The base is wide and heavy which makes it suitable for use on gas stoves without fear of it falling through the grates. Can it be Used with an Induction Stovetop? The Alessi can work on induction, however, you need to make sure the one you are purchasing states that it is induction ready. Mine is not induction ready, but I’ve seen the newer ones sold through Amazon that are. 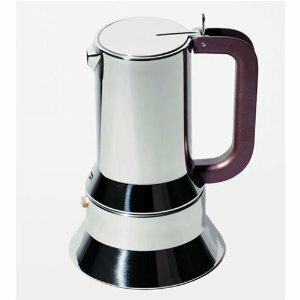 Is this Stainless Steel Stovetop Espresso Maker Sturdy? I still remember being surprised at exactly how sturdy my Alessi 9090 is. If you’ve ever used other models, you’ll know the difference the first time you feel it in your hands. I know this espresso maker will last for a very long time! It is solidly built from top to bottom, inside and out. There isn’t one cheap part in it that I could find. Seriously. Why Does the 9090 have a Copper Handle? At first, I was puzzled by this, until I did some research. Let me share with you why the copper handle is so unique. Copper is a great conductor of heat and reacts quickly to temperature changes – meaning it will cool quickly. I’ve had espresso makers that have plastic handles that I had to be very careful with over the hot heat. My copper handle will not melt, it’s not hard to grasp or use like some I’ve tried. When I tested this product I placed the handle directly over the small burner (electric stove top), and could easily grasp the handle without any issues. On a large burner where the heat was more intense, it was too hot to grasp. However, there would be no need to ever use this over a large burner anyway. The handle has a locking mechanism which locks the top and bottom pieces together when assembled as mentioned earlier. There is no screwing of the pieces together which is the more common design among other styles on the market. This locking mechanism rates as one of the best features when it comes to ease of use and functionality. One note: Although this is an excellent feature, it does take a good tug to pull the handle out of the locking position. Make sure to hold the top part of the espresso maker with one hand while you pull the handle, otherwise, it can go sliding on you – especially on a wet surface. Also, make sure to let the maker cool before attempting to unlock. I found that once I understood how to grasp it in order to easily unlock the handle, it was very simple. I can see why this never leaks – it is very solid! Protects Your Hand From Steam. In the photo above, you will see that you can lift back the lid with the latch at the top of the handle. This allows you to open the lid and peer in without having to grab a knob which is generally placed in the center portion of the lid. This is important because that top compartment holds very hot steam which shoots straight up when you open the lid. Yes, I’m speaking from painful experience. Technically, the lid should be left open while the espresso is brewing to prevent the steam from dripping back down while the lid is closed and diluting the espresso. Fortunately, the Alessi 9090 is available in multiple sizes, so whatever your situation there is a size perfect for you. To determine the right size, keep in mind that in general 1 cup size = 2.5 oz serving of espresso (a single shot) and a 3 cup size = 5 oz serving of espresso. The Alessi is offered in a 1 Cup, 3 Cup, 6 Cup and even 10 Cups. Use the reducer filter per the instructions (or my other post which explains how it works) to accommodate lesser quantities. Is there a 2 Cup Size for Stovetop Espresso Makers? I see this question frequently so it deserves a specific answer. A single cup in “espresso speak” is 2.5 ounces. So with the Alessi, to have two cups would be 4 ounces. However, there is no 2 cup size. I would recommend purchasing a 3 cup which is 5 oz and that way you get the multiple shots without having to do two separate batches. I can’t speak for every other brand out there, but this is what I typically see. I have a few reasons for this actually. The main reason is that the cheaper quality of aluminum will corrode and pit over time. I think I replaced my former espresso makers 3 times before I realized there were stainless steel options available. I’ve had my Alessi for over 7 years! In addition, there are many reports claiming aluminum is linked to Alzheimer’s. I for one, tend to play it safe and prefer stainless steel. Yes! These are dishwasher safe which is great for those like me who don’t want to take the time to clean items by hand, or are always in a rush. You are not supposed to put aluminum in the dishwasher, but with the 9090 stainless steel, you certainly can! The two most common drinks I make with my Alessi 9090 are latte mocha, plain lattes, and Americanas. I’m fairly traditional in my uses, but the possibilities go much further. For example, the espresso can be used to flavor homemade ice cream or gelato, desserts like tiramisu, or even fancy alcoholic (or non-alcoholic) drinks. It depends on the size of the maker, and the seller. You can head over to Amazon who has a good selection and pricing. 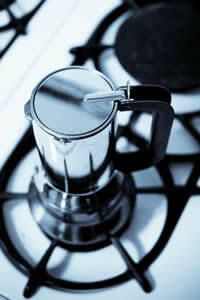 Stovetop espresso makers come in a variety of price ranges. The Alessi is not the cheapest, but it truly is the best in my opinion. I’ve owned a number of espresso makers and in my experience, you get what you pay for. I paid a decent penny for my Alessi, but I know it will last for many years and it has saved me a lot of money by having espresso at home rather than at a cafe on the way to work. On Amazon, espresso makers can range anywhere from the low 20’s on up around $200 and I suggest you check out the many reviews there. I’ve included a few links throughout this review, plus some below to help you get to the right place. Alessi products can be bought in the US and Canada. In the US there are only two branded stores, on in New York and the other way over in San Fransisco. I was surprised to learn that major department stores also carry them such as Bloomingdales and Meiman Marcus.